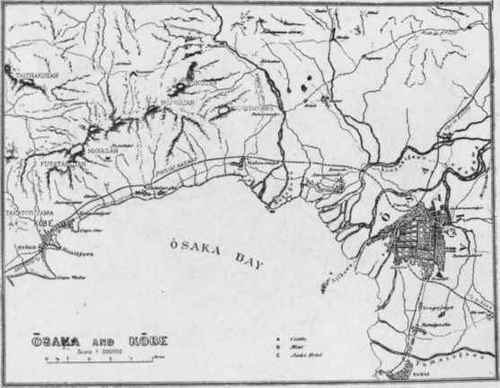 Osaka and Kobe, Japan. Example of city, back from waterfront with smaller city serving as a port. While we may properly speak of cities as having started from one centre, the largest cities have swallowed up many villages and towns, both their own offshoots and independent settlements. Thus New York absorbed Greenwich, Chelsea, Bowery, Harlem, Brooklyn, Long Island City, etc. ; Philadelphia absorbed Spring Garden, Northern Liberties, Kensington, South-walk, Moyamensing, etc., and Boston absorbed Roxbury, Dorchester, Charleston, Brighton, East Boston, South Boston, etc. The impetus of the chief city is so great as to practically obliterate the influence of the smaller towns. The importance of studying the geographical location of cities is due to the insight thus obtained into their structure, the distribution of population conforming to the same principles within a city as without. Topography operates in a similar manner, whether within or without a city, in causing population to flow along the same levels. Water surfaces, whether within or without a city, if navigable, facilitate the movement of population, and if non-navigable prevent it. The law of continuity is the same, every city being a link in the chain stretching from the first settlements in a country to the last, and every growth within a city a part of the chain of development which first reaches the city from the outside and continues its life within. Manufacturing has the same centralizing effect, whether on a large scale it creates a city or on a small scale it builds up a district within a city. The small streams of products from the farm, the forest or the mine flowing together on the way to their markets, create trade routes, and similarly the inhabitants of a city, controlled by economic forces and flowing together on their daily way to their places of business, create traffic streets or city trade routes. Railroads which create cities at their terminals and, in lesser degree, at their transfer points, have their counterpart in street railroads which draw utilities and values to their terminals, and, in lesser degree, to their lines and street intersections. Finally, the law of gravitation, which draws bodies together in direct proportion to their mass and in inverse proportion to their distance, operates similarly in drawing together two cities or in drawing together two sections within the same city. 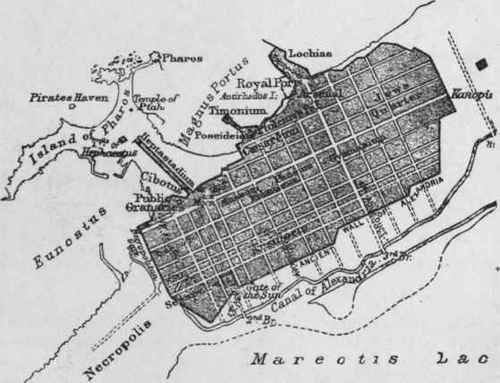 Ancient Alexandria. Rectangular plat laid out by the Royal architect. Modern Alexandria. 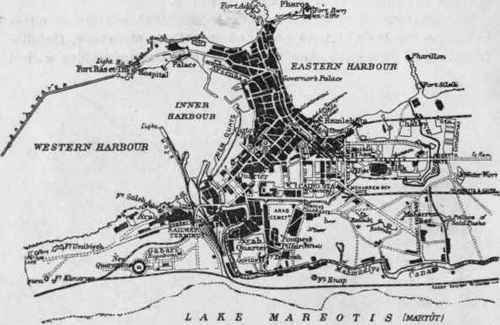 City shifted onto the former Island of Pharos. Reversion to irregular plattings.